Skyline Boulevard road repair south of Castle Rock State Park. Looks nice. On what is becoming an increasingly rare occasion, I made it up to Skyline Boulevard to check out the road. This being a Saturday, I didn’t have much hope for minimal traffic, and I was right. Weekend traffic is becoming so bad on Hwy 9 that the break in car platoons is becoming less and less frequent. So where are these people driving to and who are they? They’re hikers and cyclists going to recreate in our mountain parks. If I had my way, I’d ban cars in the Santa Cruz Mountains, except for local residents, and make everyone headed to a park take a shuttle bus. Which leads me to the new visitor center under construction at Castle Rock State Park. Not that I’m against it, but they’re gonna need a bigger parking lot. Visitors are already unable to find parking on weekends. It’s only going to get worse. Castle Rock State Park’s new parking lot and visitor center under construction. 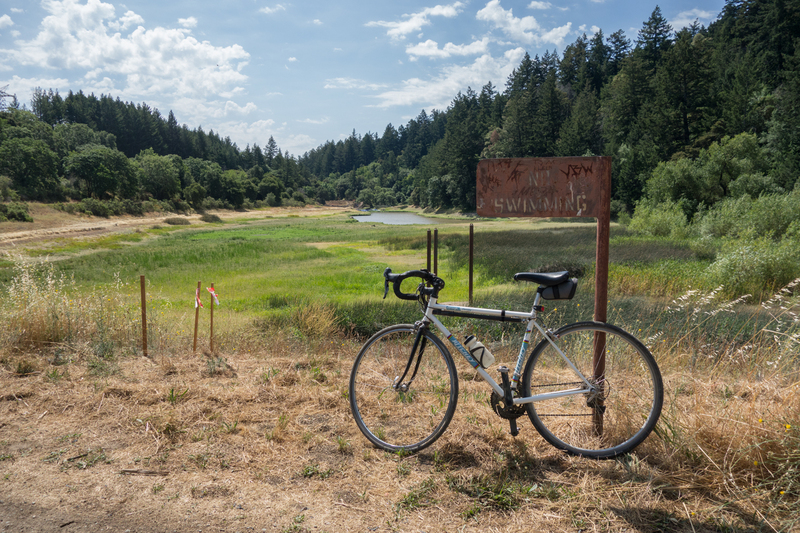 I headed to see the Skyline Boulevard public works project a mile or so beyond the park. It’s a masterpiece of road repair where a year and a half ago heavy rains washed away the road. I’m sure a culvert was involved. They always are. It looks like it was designed against such a catastrophe. There are actually two repairs, a smaller one close to Las Cumbres. I heard there was also some public works going on at McKenzie Reservoir, so I headed down that way on Black Road. Sure enough, the road has been smoothed out from lots of heavy truck traffic. San Jose Water is doing something to improve the reservoir’s outlet. The water level is low, although I’ve seen it even lower. McKenzie Reservoir is undergoing maintenance to improve outlet structures that meet dam safety standards. Finally, the last public works project was a couple of slides fixed on Sanborn Road. Road repairs continue from the previous winter’s storms. Schulties Road, I’m told, is being fixed, but I haven’t heard about Redwood Lodge Road’s slide. Cyclists can still walk through, but cars can’t make it. I’ve only mentioned a few roads that took a hit in the El Niño storms two winters ago. Santa Cruz County has pics of all the damaged roads in a PDF file. This entry was posted on July 21, 2018 at 2:50 pm and is filed under Ride reports. You can follow any responses to this entry through the RSS 2.0 feed. You can leave a response, or trackback from your own site. You got to pick the right time to ride. Very early or in the evening (during summer) were good times to ride up nine for me. Still is a great place to ride a bike on weekdays if you’re retired or have an adjustable schedule. I don’t ride up highway 9 during the summer anymore unless I can get to Saratoga before 7:30 am (climbed it yesterday). The car drivers on 9 are now much more courteous to bike riders than they were only a few years ago. The issue in the summer is the motorcyclists, not the Harleys, the racers. They are going 80 to 100 mph up 9 and that is disconcerting to everyone, including car drivers. 1. Montebello Road, continue past the gate and take the trail to Page Mill and then to 35. 3. Black road via John Nicholas Trail via Sanborn Rd. 4. Old La Honda Rd in Portorla Valley – most know about this one. None of these roads have much traffic year around.